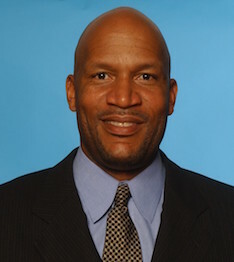 Ron Harper played basketball for Miami University in Oxford. Ron is the second leading scorer in Mid-American Conference history. He played at Miami from 1983-1986 and became the first player in Miami history to have his jersey retired. He was selected as MAC Player of the Year in both the 1985 and 1986 seasons. With 2,377 career points and 1,119 rebounds, he became the first player in league history to top 2,000 points and 1,000 rebounds. He went on to play professonally for 15 years and earned 5 NBA Championship rings. The high flying Harper was drafted by the Cleveland Cavaliers in the first round of the 1986 NBA Draft (eighth overall pick). After three years with the Cavaliers, he was traded to the Los Angeles Clippers, where he spent three seasons before signing a free agent contract with the Chicago Bulls, with whom he won three NBA Championships (1996-1998). In 1999, he signed with the Los Angeles Lakers and helped them win two NBA Championships (2000 and 2001). He served as an assistant coach for the NBA Detroit Pistons from 2005-2007.